Ruth Dowell was one of those gifted school teachers who possessed the ability to influence and inspire her students to do more than just ‘learn English.’ She expected her students to do more than learn proper sentence structure or to write an acceptable essay – she expected those in her classes to be aware of the greater world around them and of the future that lies ahead. Ruth Elizabeth Dowell was born to Captain John Stewart Dowell and Elizabeth William Dowell, in the family home on South Parker Street in McKinney on October 30, 1894. Miss Dowell’s father came to Collin County from Smith County, Tennessee in 1856, following the deaths of his parents, to live with an uncle. He served in the Confederate Army and was wounded in three separate engagements – Seven Pines, Fredericksburg, and Gettysburg. He was captured by Union forces and, after 20 months in captivity, returned to Collin County in 1866. In later years Captain Dowell became involved in the McKinney schools and local government, serving on the school board and county board. Miss Dowell attended local schools and following her graduation from McKinney High School in 1911, attended Mary Hardin-Baylor College in Belton, where she earned a bachelor’s degree. She was one of six daughters in the family to graduate fro Hardin-Baylor. 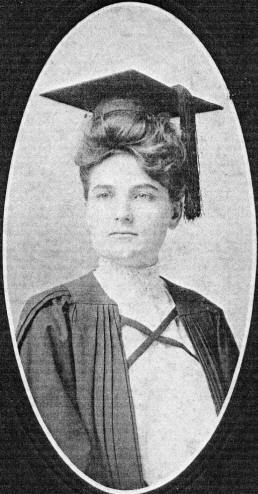 Following graduation she attended the University of Chicago, but returned to Texas, where she earned her master’s degree in 1918 at North Texas State College in Denton. She then began her 45-year teaching career with the McKinney Independent School District. Miss Dowell, who never married, was an unselfish teacher, strict but friendly, and well-known for her sense of humor. She retired from teaching in 1962, and even though she lost her eyesight just a few years later, it did little to curb her enthusiasm for living. Miss Dowell died on January 20, 1991 at the age of 96 years. In her will she established a scholarship fund so that she could continue to benefit MISD students after her death.